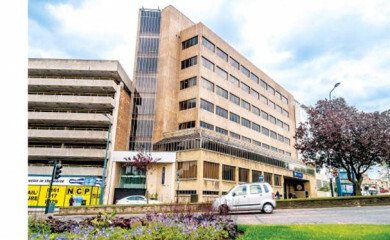 An empty office block which was a centrepiece of Bradford’s transport interchange will reopen next year as a residential development after changing hands in a £2 million deal. City Exchange will undergo conversion to create 119 apartments after being acquired by The Lettings Room, Sheffield-based agents with a portfolio stretching across the north of England. Jason Barnsdale, Managing Director of Barnsdales residential and commercial property specialists, acted for the purchasers and said there was strong competition for the property. Bradford-based Mark Brearley & Company had placed the 65,334-square foot property on the market on behalf of City Exchange Investments Ltd, promoting its potential for prime residential development in a unique location. Mark said: “It was occupied by the former West Yorkshire Passenger Transport Executive and then by Bradford Council but had been vacant for about five years. This deal takes a big, empty property off the market and will create something very significant for the city centre. Barnsdales, which is based in Doncaster, operates in all residential and commercial sectors and has become particularly active in the acquisition of substantial office blocks for conversion to residential. Earlier this month the company announced the purchase of St Peter’s House in Doncaster for Empire Property Concepts, having last year secured Joseph Locke House in Barnsley for the same developer. Jason said: “There is a strong student market in Bradford city centre which, coupled with the location of City Exchange, attracted a lot of competition for this property. The deal was completed very quickly during the summer but was conditional on securing permitted development rights for conversion to residential, and that has now come through. “We have done a lot of work recently on project like this. We became aware of the opportunity through our contacts and our market knowledge and we had a number of potential buyers in mind.